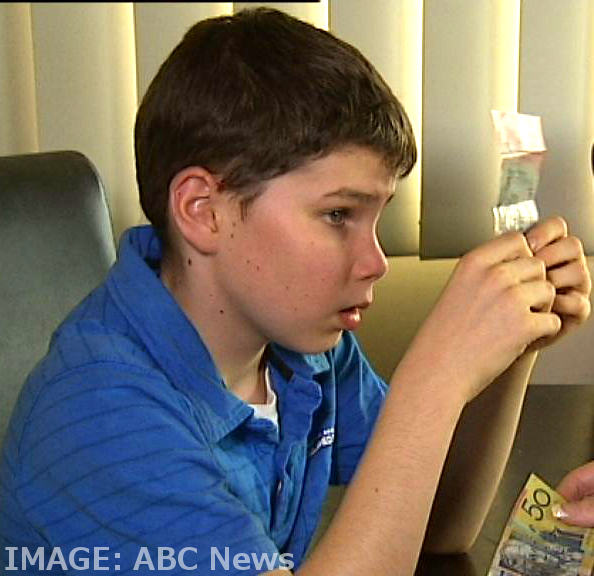 A 13-year-old blind boy has successfully campaigned to have the RBA print tactile banknotes. “I received some notes at Christmas time and I kept having to ask Mum what they had given me,” Connor McLeod told ABC reporters this week. Connor has been blind since birth due to a congenital disorder. “I didn't touch notes because it was really annoying and embarrassing that I couldn't differentiate between them, but I could differentiate coins so I used to go around with only coins in my wallet getting stuff from the canteen with them. The Human Rights Commission and Vision Australia supported Conner’s year-long campaign, along with a petition signed by 57,000 people. The young man lobbied the RBA at a meeting last November, leading the central bank to announce it will add a tactile feature to all bank notes. RBA Governor Glenn Stevens says the tactile addition will help vision impaired people tell the difference between denominations, in addition to the bright colours, large and bold numbers, and different sizes. Vision Australia advocacy general manager Maryanne Diamond said Conner’ plight was one shared nationwide. “What we found in Vision Australia in a recent survey is that 50 per cent of people who are totally blind are telling us that they feel that at times they have been short-changed, or given the wrong change when they've purchased something, simply because they can't quickly and easily and effectively distinguish notes,” Ms Diamond said.